Expert surgeons across the globe are using the most advanced techniques for facial hair transplantation. 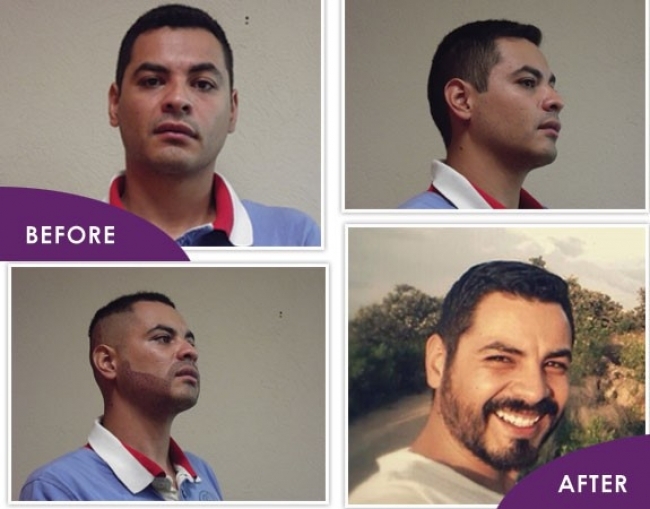 Facial hair transplantation is a commonly performed hair transplant procedure designed to transplant scalp hair to facial regions that are deficient in hair density and fullness. Are You Considering a Beard Transplant? Recent modern advances have broadened the options available for patients interested in hair transplantation, specifically men. Hair restoration of the beard, goatee and sideburns has become a trend for men who have thinning or nearly absent facial hair. Men who have suffered facial hair loss from trauma to the face, which caused scarring or previous surgical procedures such as facelift that resulted in stunted hair growth can benefit greatly from this innovative procedure. Beard Transplants are very similar to the process used for other hair transplants. First, follicular units ae harvested using FUE techniques from the back or side of the head. The harvested hairs are planted at the recipient site. Surgeons can use existing hair lines in guiding transplantation and ensure grafts are placed at the correct angle of facial hair growth. The immediate post-procedure results are typically equivalent to what a beard would look like after three days of no shaving.